Wonderful! That so reminds me of a gal I worked with. On Fat Tuesday she would always bring a lamb cake into the office! I can't find a recipe for a Lamb cake, but my daughter makes a bunny cake! Visiting from SITS! Forgot to mention! I also have some other blog carnivals going on! That post title made me laugh out loud. Great cake. I love all that you are doing with your place, it's looking great. My favorite is the front yard, I agree, good bye ugly fence!! Huge bummer about the carpenter ants, I am sure you were about ready to throw up when you saw that. UGH!! Just stopping over from SITS and glad I did. Off to look around some more. 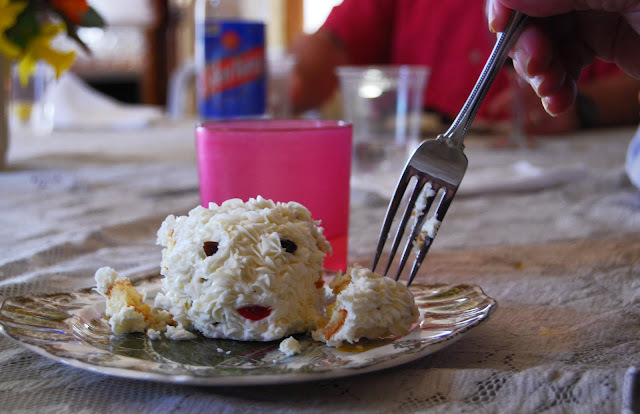 I made a lamb this year with Rice Krispies Treats and you should see what my adult children did to it. Come over and read my Easter recap. This is sooo funny! I love it! Here from SITS - great blog!